My kids are sitting at this moment watching episode 1 “Butterfly” of the Hop- A- Long Schoolhouse DVD-series 1. I was worried because it was so quiet that I went to check and see how they were doing. They immediately shushed me and told me that I was interrupting “their show.” The only sound that I could hear from that point on is their giggles as they enjoyed learning about butterflies, their habitat and what we can do to protect the butterflies and all the creatures of our world. My three young children were then overheard talking about all the ways they could help protect the butterflies in their backyard. My 5 year old even drew a picture of the lifecycle of a butterfly. Hop-A -Long Schoolhouse has a colorful cast of characters including Hop-A-Long, his side-kick Shoo-Fly, Mr. Bookman who is a passionate “verb-ivore”, Miss Wendy the Science Lady and Miss Sugar and Ringo Roo who loves to sing and dance. Hop-A-Long Schoolhouse and its fun characters were created by David Hoss and the Singapore American School. It became so popular with students and teachers that this first DVD was born. I really love that Hop- A -Long Schoolhouse takes learning and blends it into a fun and entertaining show. My kids talked a lot about each episode in depth and wanted to learn more about butterflies, polar bears and pet care. As a home educating mom that is invaluable to me in any learning supplement. 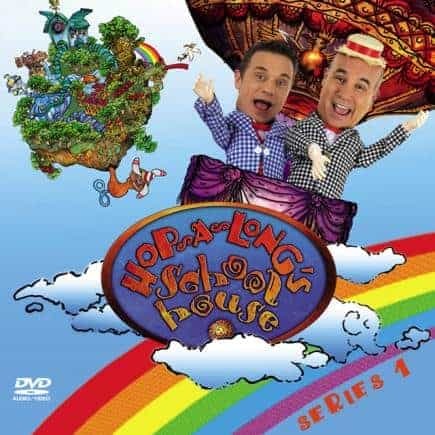 Hop-A-Long Schoolhouse includes three DVD episodes (24 minutes each), a bonus CD of songs and even a poster. This would make a great gift idea for any child ages 3-10 and is sure to be a hit. It is creative and unique and certainly not ordinary T.V. fair. If you are a homeschooling parent this is a must have for your collection.